As a long standing admirer of your blog, I am always excited about your projects. I hope you don't mind if I share this brilliant idea at 973 Third. Many thanks for sharing your genius! This is amazing! I will do this!! Thanks! Wahoo !! It is fabulous !! 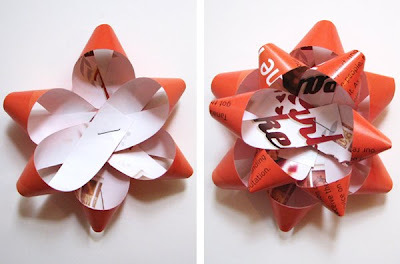 I like this idea and will try to use it for my Christmas gifts.. This is brilliant! Along with recycled gift tags and scrap fabric bags, my Christmas is going to be really green this year. I found you via Crafting a Green World. This bow is fantastic! I linked to this tutorial from my "Conscious Crafting" blog--and copied the picture over to entice people to click. :) Hope you don't mind! Wow, how did I miss this?? I just made 2 bows out of my 2009 work calendar... and used the paper cutter to cut strips for 10 more bows. I have so many gorgeous calendars that I just hate to get rid of. I will never buy another bow again! Thanks! Thanks for this great idea. I love this bow. Specially since you can make it from recycle paper. Happy holidays. Mine aren't coming out as pretty as yours did, but will keep trying. Practice makes perfect! You can buy the bow maker you were talking about at the Container Store and maybe Hobby Lobby. I think you could use the bow maker and the magazine pages together instead of tape or staples. I am going to give it a try. I love these! I also once used the bow-maker at a former job for a chocolatier and I was missing it! I love making all kinds of bows and this one is just so much fun to make with my little guy and to show how something can be reused. i instantly made one once i saw the tutorial.. so easy! PERFECT! I have been wondering what to do to set my gifts apart this year...you know, besides their general awesomeness! Thank you so much for the brilliance! 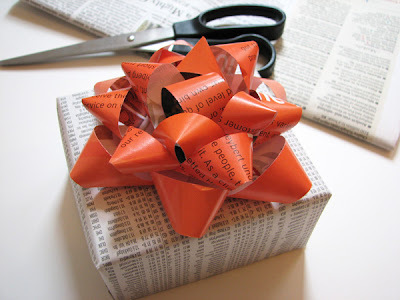 These are so great - perfect for my last-minute gift wrapping! I had to post about these on my blog and I added a link to you. Thanks so much for your creative idea! Absolutely Fabulous, girlfriend! So quick and beautiful!!! Love it...Love it....Love it!!! Kitty. Made some and they all loved them; it's like giving two gifts. Brilliant project. arghhhhhhhhh simply AMAZING and so simple! This is just WONDERFUL! I'm gonna go make plenty to have always handy! Holy moly. Those look AWESOME!!!! This is too cool! 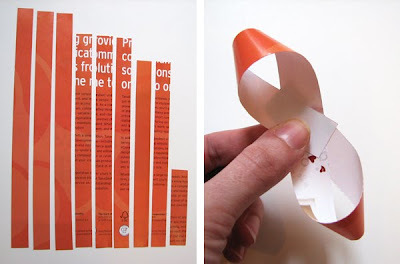 I love using magazine pages for other things, but I've never tried this! I love it so much, I'm going to give you some Blog Love in my "Humpday Tutorial" on Wednesday! Thanks! LOVE, LOVE, LOVE this idea! All my scraps will have new life and a home on top of the gifts I give. How fun and the possibilities this has!!! Thank you Jess - you rock! I love this...what a cool idea. I'm fond of practical ideas with a neat twist. Thank you! Thanks so much Jessica ...and here the result direct from Paris, France !! Well - I'm a bit late, but I just found this tutorial and LOVE the bows. What a clever piece of diy. Thankyou so much for this tutorial. Will make a great project to tackle with my daughter on a rainy day. I never even thought of making these bows myself - what a great way to re-use stuff! love it thanks, it's very easy, quickly, and save money too!! I love this! I linked to your tutorial from my gift-ideas blog: http://thoughtsonthepresent.com/?p=117. Thanks for the great idea! I work in the land of magazines - so i know i have another thing to do with the pages - thanks for sharing! I also sometimes use used magazines especially the glossy ones to wrap give away items whenever we have a family occasions. 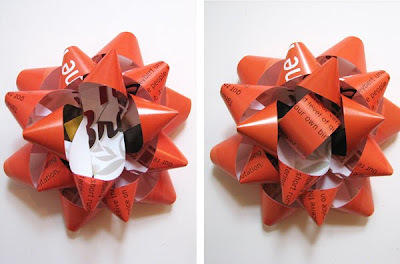 Aside from costing us nothing its a great way to recycle those old but still useful magazines. I am so addicted to making them now! I love making things from old magazines, maps, etc... I will be making some of these! Thanks! I know, I'm a little later than.......well, everyone, but I wanted to let you know that I LOVE, LOVE, LOVE this idea!!! It's SO eco-friendly and your tutorial was SO easy to figure out!! I'm a new follower but already I love your stuff!! LOVE IT! Thanks so much for sharing this...it will be really fun to do with my Godchild and my Nieces! I just wanted to let you know that I posted a link to your blog and this page on my blog. I made one myself but I want anyone who wants to see the tutorial to visit your blog. Hope you don't mind! Love your blog! Forgot the link to my blog....lol. Holy crap. You are a genius. I am in love. I always want to go eco repurposed with my wrapping and have mourned styly bows as a casualty of my idealism. No longer!!! And posted a photo of mine! Great photos... didn't realize it's that simple... bows have always been a mystery to me!! Thanks for the great tutorial. selama nie memang dok cuba buat tp tak berjaya tapi sekarang dah dapat cara yang betul...terima kasih daun keladi. this was so easy. i used extra wrapping paper and it looks great. I learned that from my grandma years ago, it is amazing how with a simple magazine we can make wraps. Love your site. Thanks for the tutorial. My first post on my blog showed my attempt at the bow. You can check it out here. The bow you have made is great! I haven't put bows on package in years because when we buy the bags full they always get crushed before we get home. I gave up! Now I will make my own! Not to mention they will match my packages!!! Love it!! My daughter and I just a few of these bows. Awesomeness! Our first one was clearly a test run lol. Definitely doing this again. :) Thanks for getting our creative juices a flowin. So creative. I featured this bow on my blog today. Hop on over. I love this project idea! It's super fun but took me awhile to make. Also, I just wanted to let you know that I shared a link to your blog post on my Facebook fan page which is linked to my craft blog! You can find me on Facebook at Creative Crafts for Creative Kids and on Wordpress at creativekidscrafts.wordpress.com Happy crafting! 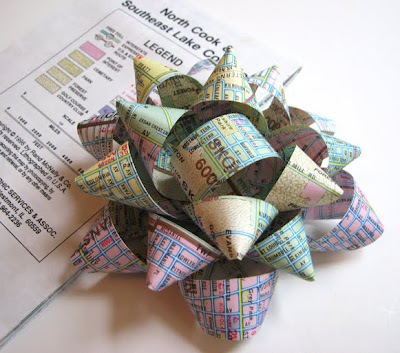 These gifts bows made from magazines are great! Thanks for the information. So totally clever and cool. I recycle my magazines but this is super cool! Thx, you have a gift. This is fantastic. As a mother of 4, I'm always looking for ways to save, and I was needing bows. Now I don't have to do without. Thank you!! I'm very anti-crafty for anything non-digital but felt compelled to attempt this & was thrilled to see the results! Feeling very proud of myself & will make these for decor & gift topping...thanks so much! I Love this! I have found other patterns for this type of bow, but I like yours the best! I found your blog while surfing the web, and I am subscribing today!!! That's a brilliant idea, great work. It shows that you don't have to spend much money to have beautiful project like this one, all you nee is labor of love :) and thanks to you for sharing you creative work. I just wanted to let you know that you're on the map! I been wanting to make these since last christmas and I finally did it today! I posted it about it on blog because I loved them soo much. Thanks a bunch! I am telling everyone about it! This is so rad! I've been experimenting with magazine wrapping for quite some time now and am so happy to see another creative magazine recycler! What are these inches in centimeters? I've no idea what 3/4 means. I don't get home until the 23rd so wrapping is going to be a quick affair- i'm definitely doing this!! This is awesome - thank you for sharing this! I found these after I tackled several of Kristen's felt bows and WOW-- beautiful! Now I'm going to search out some old newspapers-- I'm going to make a bunch for the staff gifts at my husband's newspaper company. Has anyone tried these with regular fabric (i.e. quilt patterns, vintage prints), or would they be too floppy? I am a blog-posting virgin...but I felt compelled to post that this might be the coolest thing I've learned online this YEAR! Love these! I wipped them up out of wrapping paper and popped them on my Xmas gifts to the little ones!! Wow! You are a genius! Brilliant! I'm so happy to find your blog!Love your blog! Looking at it can be very simple but in reality it is quite hard. I've just tried making one and it's easy and beautiful. I have a monstrous pile of magazines I don't read anymore --tonight I'm making tons of these bows. I'll keep them in a bag with my other gift-giving supplies so I'll always have one on hand. Thank you for this idea, and for this clear tutorial. Have a nice day! Love it, will definately be making some of these, and teaching my school kids aswell!!! Absolutely brilliant! Our family has recycled our bows for years and many of them are quite shabby! This would be a fun way to make some new ones! I love the idea!Thank you! Fantastic tutorial...thanks so much for sharing. Off to look at the rest of your blog. Thanks for the tutorial.Made a bow using a cookie box liner, which are silver colored. they look very nice and festive too. now i dont buy bows anymore. Thanks for the great advice. The tutorial was very easy to follow. Thanks for the info. What a stellar project! You have found a way to cheaply and easily recycle something that everyone is trying to get rid of into something everyone needs. Rarely do I find a crafting project that achieves this. Most craft projects create something that I really don't use. I am in awe of your magnificence. This is awesome. It would be great if you got the kids to decorate some paper and then cut it up and make into the bows. Thanks for the information. I keep in mind. Yay! Deb from Australia here. Just used your awesome tutorial to add a bow to my father-in-law's gift. I printed an A4 sheet of paper with "Happy Fathers Day!" in two contrasting colours (one per side) that matched the wrapping paper I used. Cut. Loop. Staple. Stick. Bow. Now I don't need a gift card. :) Thank you, thank you! It's posted in the Craft tab. Thanks!!! These are so AMAZING! I actually came over from Frugal Girls, and I'm so glad I did! Very useful little things :] I love them! OMG! This is a very amazing idea. I wonder how far I can go in terms with the size of the bows. I have always wondered how they made those too! This project is perfect! You are an upcycling genius. I hope you don't mind that I linked to it on facebook. I have been looking for a tutorial on these type of gift bows ALL OVER! I plan to make these with real ribbon and use them again and again! Thank you for posting this. I have made some and they are awesome. Loved this so much I just re-posted on my blog The Real Housewife of Zurich! Perfect! Just the thing I needed at 4:14AM! Saved the day with this cool trick. Thanks! love it i made ine with plane orange paper im from essex. planning to share this with our school's green club. What a great activity for them to do near the holidays. May even be a good fundraiser. The possibilities are endless! I absolutely love this! perfect way to recycle and save some money! :)...thanks for sharing! I am definitely going to be using this ALOT!! cute AND green! :) recycled gift wrap is the best kind! Seriously easy! Now I don't have to leave the house to get a bow for my hubby's anniversary gift. Thansk! Thanks a lot for sharing it! it's a great and handy idea for presents! i won't buy any more bows for present wrappings! I love your site, Cool project for making bows..I have my own tutorials for other accessories please Join my site..Thank you very much for sharing with us.. I love this craft! I will never buy another bow and I have shared this link with several people. Thank you so much! After a bit of experimenting with glue dots, staples, doublesided tape, I found something that worked the best for me. After making the loops, I punch a hole in the center of each and push a brad through, then tape circle to brad. Holds really tight and makes my bows more secure and neater. This is awesome thank you. I was going to buy a bow for a gift for one of my friends. Now I can save money and make one that is way more beautiful and creative. Love this! I'll be linking back to you this month because I'm doing a bunch of holiday gift wrap posts. Sorry to be such a dolt, but can you give measurements in inches for each strip? I love these bows and found them via Pinterest, through another thread made from felt. Such a beautiful PRESENTation! No problem, Cat. I've added the measurements to the post. Chip bags, candy bags and candy wrappers work well, too! I SEW!!! I POKED A NEEDLE THROUGH EACH AND POKED IT BACK THROUGH, TYING IT IN A KNOT TO SECURE. Thanks so much! What a great idea. Just made my first one for Christmas. I just wanted you too know I am one more of many that love this easy to use post from you! Thanks for the cool idea I have posted on my blog ones I made and linked your blog for them to get the info! Thanks! I'm not sure where I can unsubscribe you myself, but is there anything at the bottom of the emails you're getting that state how to unsubscribe?